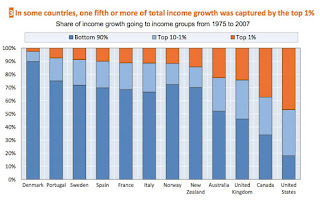 The chart above, from the Organization for Economic Co-operation and Development (OECD) using the World Top Incomes Database, shows how income gains between 1975 and 2007 were divvied up in 18 OECD countries for which the researchers had data. 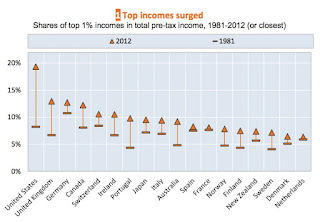 Nowhere did the rich benefit as much as in America. 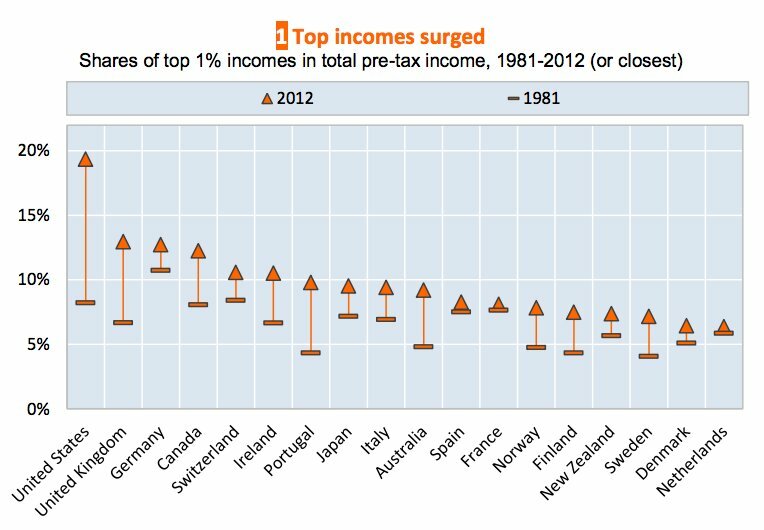 As you can see, in some countries like Denmark the vast majority of income gains went to the bottom 90 percent -- SOCIALISTS! -- while nearly half of U.S. income gains went to the richest one percent because freedom, baby. America’s top 1 percent of earners accounted for 47 percent of all pre-tax income growth over that time period. And that’s excluding capital gains, for God's sake. Throw in the rest of the top 10 percent, and you’re looking at a group that got four-fifths of all income growth between the Ford and George W. Bush administrations. The rest of us were left to scramble for the last one-fifth of extra income. If you add in capital gains, which typically accrue to the highest earners anyway, the picture is probably a lot worse. But for truly shocking numbers, consider America’s even more-exclusive 0.1-percent club. Those super-duper-rich people -- we’re talking Warren Buffett rich -- saw their share of the income pot jump all the way to 8 percent in 2010 from just 2 percent in 1980. 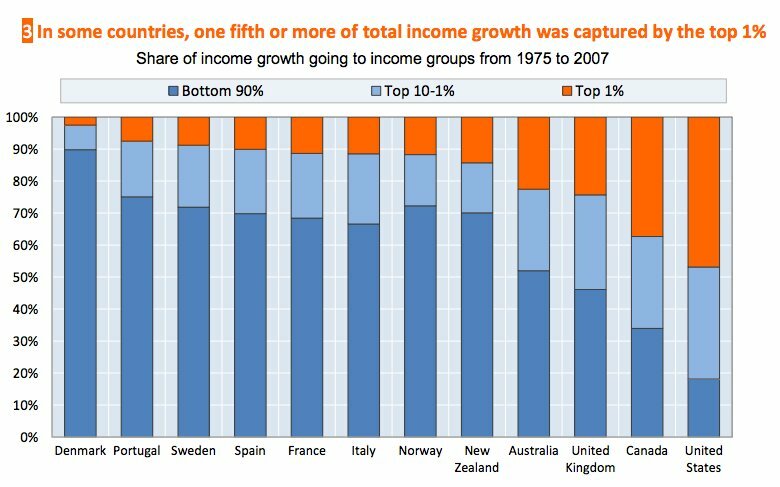 The super-duper rich swoop up smaller percentages in countries like Canada, the United Kingdom and Australia. The super-rich getting super-richer would all be well and good, except that it doesn’t appear the nation’s “wealth creators” are creating much wealth for anyone else. According to the OECD’s report, the pre-tax, inflation-adjusted incomes of the bottom 99 percent have only grown by an average of 0.6 percent per year in recent decades. Add in the top one percent, and the country's income growth rate jumps to 1 percent. This lack of trickle-down prosperity is a key focus of Capital in the Twenty-first Century, the new manifesto by French economist Thomas Piketty that destroys the argument for supply-side economics. A common argument put forth by defenders of income inequality -- yes, they exist -- is that a rather large percentage of Americans move in and out of the 1 percent over the course of their lives, so the divide between the rich and everyone else is a bit of a false distinction in their view. But while the country's economic mobility hasn’t gotten worse over the past few decades, it has essentially plateaued at a level lower than that of the Canadians. And I think we can all agree that if we have to deal with American levels of inequality, we can at least strive for Canadian levels of mobility.
. For the next business day they will get their money. Going online makes people’s lives easier and happier. People need support in any life situations and it is vital to offer it to them.